Enjoy the ultimate in ambiance and comfort with the Classic Flame built-in electric fireplace with realistic flame effect, full ember bed and hand crafted glowing log set. Functioning glass doors, retractable fire screen, brick interior walls and ceiling, and a multifunction remote are standard. The zero-clearance design allows flush mounting to drywall, tile, or installation into a finished wall opening. ‘Easy Access’ front serviceability is available only from Classic Flame. The heater function can be hard- wired for either 120 volt service (4,600 BTUs), or 240 volt service (9,200 BTUs) and can be controlled with a separate wall thermostat (not included). 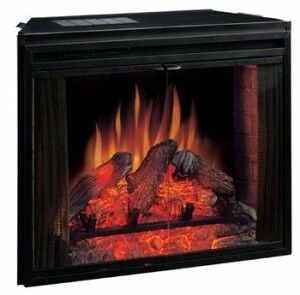 The fireplace effect can be used with or without heat for year round enjoyment. These built in models are designed for professional installation and are not ‘plug and play’ products, they need to be built in to the structure of the home. Regular 110v electrical outlet needed, or can be hard wired for 220v Indoor use only.